As the summer hard court season came to a close at the US Open a few weeks ago, the tennis world now turns its attention to Asia for a final run of outdoor, hard court events in 2014. Fittingly dubbed the Asian Swing, the series consist of tournaments throughout China, Japan, Korea, and Hong Kong. The tournaments that make up the Asian Swing vary from year to year however they are anchored by the China Open WTA premier event and ATP Shanghai Rolex Masters 1000 series. The joint tour event in Beijing takes place at the end of the September and is a highlight of the Asian Swing. It acts as a premier event on the WTA side and a 500 series event on the ATP tour. It is played at the National Tennis Center which was also the venue for the 2008 Beijing Summer Olympics. The tournament, surfaced by DecoTurf® features custom court colors. It is rumored that Chinese super star, Li Na, may retire after this year’s tournament after missing out on the summer hard court season due to knee injury. The highlight of the ATP Asian Swing is the 8th Masters event of the year, the Shanghai Rolex Masters. This ATP exclusive event boasts past champions Novak Djokovic and Andy Murray. 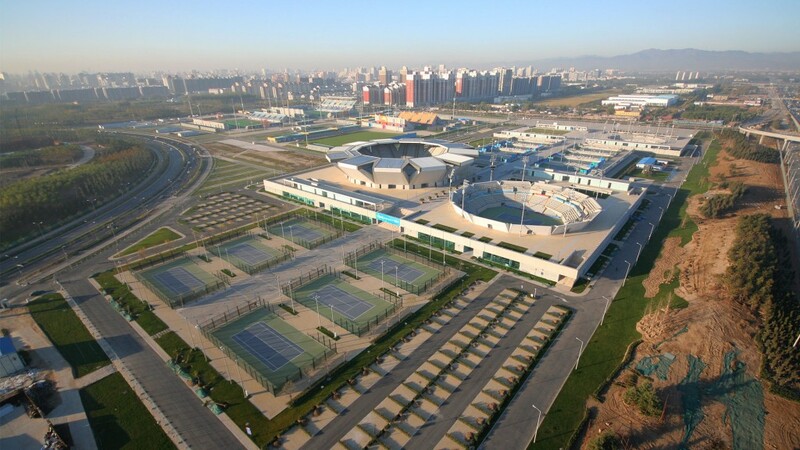 The Qi Zhong stadium that hosts the tournament was originally built for the ATP tour finals that were held there between 2005-2008. Center court seats 15,000 and has a one of a kind roof shaped to mimics petals and closes in 8 minutes. DecoTurf® and Plexipave® are proud to partner with WTA Asia naming them the official surfaces of the governing body. In addition to surfacing many of the Asian Swing facilities, DecoTurf® and Plexipave® also help sponsor a series of tennis festival that coincide with the tour events. These festivals help support grassroots tennis in China as well as spread the love of tennis to new fans. DecoTurf® and Plexipave® are proud to be a sponsoring member of these festivals that support and grow tennis throughout the Asia Swing. There has been much discussions over the years about bringing a 5th Grand Slam to the tour. Many within the industry have made the argument that China would be the best location if the Slams ever expand from 4 to 5. Now more than ever with the success of Asian players in 2014 does the argument stand up. China’s most successful player Li Na won her second Grand Slam title at this years Australian Open and Kei Nishikori of Japan recent trip to the US Open finals made him one of the most popular athletes in his home country. This entry was posted in California Sports Surfaces, DecoTurf®, Plexipave® and tagged California Sports Surfaces, China Open, DecoTurf, Japan Open, Li Na, PlexiPave, Shanghai Rolex Masters.